Colombian versions of a Wealth Tax and a Financial Transaction Tax grab attention of global financial experts, as the government looks for a progressive means of funding post-war national reconstruction. As governments all over the developed world try to come up with solutions to their respective social and economic crises, with the need for urgent funding for social spending as ageing societies try to recover from a generational recession, one of the world’s most unequal and violence-ridden countries is pointing the way. Colombia, near the top of the inequality rankings in what is the world’s most unequal region – Latin America – has recently pushed through a reform to its tax system that includes the consolidation of two strikingly progressive taxes that have drawn praise not just from centre-left observers around the world, but from the supposed bastion of neoliberal economics itself, the International Monetary Fund (IMF). That such examples of progressive taxation should come from a socially conservative country as Colombia is remarkable in itself, let alone while a centre-right government (led by President Juan Manuel Santos) is in power with the main opposition coming from the far-right Centro Democrático led by former President Álvaro Uribe. Yet that is the compromise that the government has made in its bid to set in motion a comprehensive project of national reconstruction, following more than half a century of bitter and violent civil war between the state, left-wing guerrilla rebels, and right-wing paramilitaries. The taxes, known as the Wealth Tax and the Four Thousandths Tax (a Financial Transaction Tax or FTT), initially came into being during the presidency of Uribe (2002-2010) with the aim of raising extra government revenue to fund war efforts against the leftist rebels, of whom the FARC are the most prominent. However, the measures were due to be wound down and expire over the coming years, and now the Santos administration has decided to extend them – only this time, the proceeds would be used to fund peace instead of war, with the hope that ongoing peace negotiations between the Colombian government and the FARC in Cuba can lead to a definitive peace treaty that would bring the 50-year old conflict to an end. 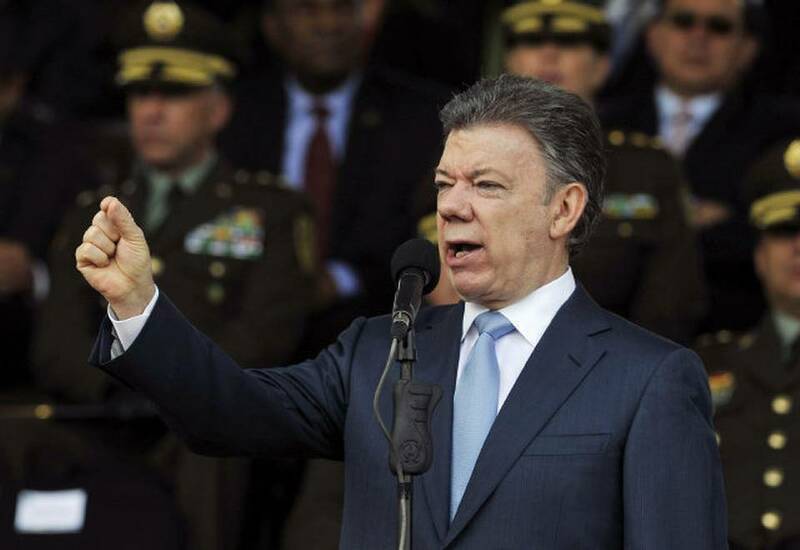 Colombian President Juan Manuel Santos has been vocal about the political and moral arguments in favour of the wealth and financial transaction taxes. Photo courtesy of AP via the Miami Herald. The wealth tax is aimed at those with assets worth more than US$500,000, which currently covers around 50,000 Colombians. One of these is President Santos himself, who has made little effort to hide this fact and instead has led calls for the country’s wealthiest individuals and companies to make a small sacrifice in the name of healing the social divisions that have resulted from and sustained the conflict. The reforms initially would have seen the threshold at which individuals begin to pay the wealth tax fall to around US$380,000 in total asset wealth, but this and a couple of other proposed tweaks were eventually abandoned under pressure from the Colombian business sector. However, even without the attempted reforms the tax remains progressive. For those whose wealth ranges from US$500,000 to US$1m, a 0.2% tax is paid each year. This rises to 0.35% for those with a wealth of between US$1m and US$1.5m, 0.75% for those with a wealth of between US$1.5m and US$2.5m, and 1.5% for anyone with assets worth more than US$2.5m. The Four Thousandths Tax, meanwhile, represents a small charge on financial transactions which are “aimed at withdrawing resources from checking, deposit or savings accounts and cashier checks” (according to a Colombia Reports article that describes the overall tax reform). At the moment, the tax is actually a two thousandths charge, or 0.2%, and was slated to be phased out by 2018. However, the reform will see the tax raised to 0.4% until 2018 – the end of the current government’s term – before it is phased out through 2022. 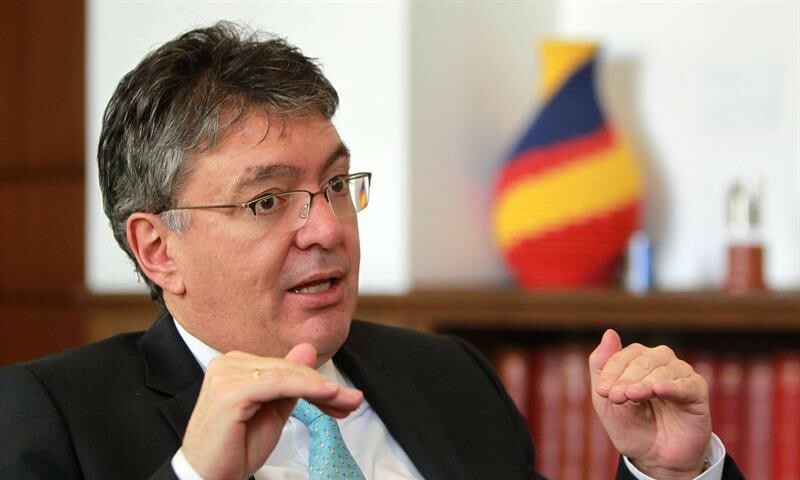 Mauricio Cárdenas, who as Colombia’s Finance Minister since 2012 has been one of the principal architects of the Colombian tax reforms. Photo courtesy of Efe. According to Finance Minister Mauricio Cárdenas, the overall tax reform package will see government revenue boosted by as much as US$6.2bn in 2015, once it comes into effect in the new year. The amount raised will clearly be a major boon to government efforts to fund a rebuilding and healing process of a Colombian society that has suffered greatly under the civil war. Government leaders and officials have repeated a mantra based on the idea that ‘war costs more than peace’, arguing that while the peace and rebuilding process will be long and hard and require significant funding, the benefits will far outweigh the costs given how much damage war has done to the country’s economy and society. Politicians have suggested – with surveys to back them up – that Colombia’s annual GDP growth rate could increase by around 2 percentage points if the peace talks with FARC come to a successful conclusion. This would largely stem from the stability that war-torn regions of Colombia would finally enjoy, as local economies would finally be able to operate without the fear and disruption of attacks and kidnappings. Meanwhile foreign investment in the country as a whole would almost certainly increase amid a more stable political and security climate. Part of the Colombian tax reforms will also see a concerted effort to clamp down on tax evasion, with criminal sentences to be imposed on those who attempt to hide the true value of their assets or income, either at home or abroad. The government hopes to raise an extra US$10bn over the course of its four-year term as a result of this clampdown. However, its sincere attempts to crank up the strong rhetoric against tax avoidance left it in hot water with neighbouring Panama, after Colombia included its Central American neighbour on a list of tax havens. This measure meant that Colombians transferring money and assets to Panama, which has considerably lower tax rates than other Latin American countries, would have to pay a much higher rate of tax to Colombian authorities – 33% instead of the current 10% – as a way of deterring them from moving their assets abroad. The move sparked a diplomatic row between the two, and Colombia finally agreed to remove Panama from its tax haven list before the measures came into force, on the provision that the two countries entered into official talks about establishing financial transparency mechanisms, in line with OECD standards. The events also come at a time when the impact of tax evasion and corruption on inequality in Latin America is in the spotlight, with experts warning that not only are such criminal activities “flagrant violations of human rights”, but the resulting loss in governments’ capacity for public spending means that “those who are most vulnerable are denied the full enjoyment of their economic and social rights, including health and education”, according to the UN Development Programme’s Rocío Noriega. The money raised by the tax reforms will apparently go towards government efforts to rebuild Colombian society in the aftermath of a peace agreement between the Colombian state and the leftist FARC guerrilla rebels. Talks have been taking place in Cuba over the past two years in an attempt to bring a half century of conflict to a conclusion. Photo courtesy of Infolatam.